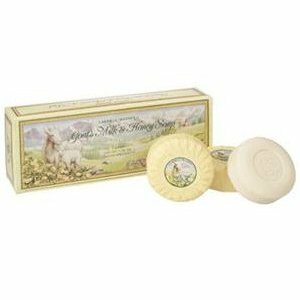 Caswell-Massey Goat s Milk & Honey Soap is excellent for sensitive skin because it is rich with proteins, mineral salts, vitamins and liposomes. These soaps come individually wrapped and triple milled to exude a rich, creamy-as-butter lather to soften and restore the skin s natural beauty. Ideal for both the face and body. The delicate honey fragrance will not affect even the most fair skin.